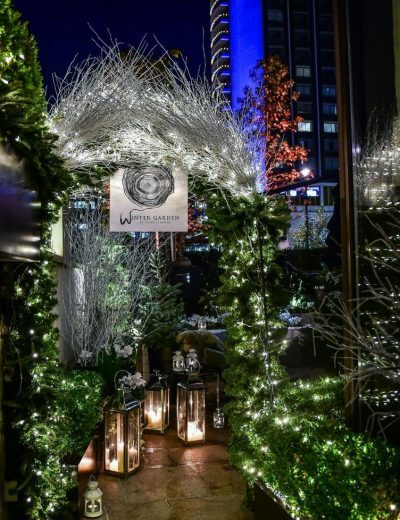 We had the wonderful opportunity to visit the Four Seasons, Park Lane Winter Garden on Tuesday evening and were swept away by an enchanting wonderland. Arriving we were ushered by a smartly turned out top hatted doorman who led us swiftly to the entrance of our wintry retreat. Opening a tiny gate, we stepped in, excited for what lay in store. It was like entering through the wardrobe into Narnia, we could almost hear the sound of tiny animals running through the snow on a Christmas evening. We were welcomed by a friendly waiter who showed us to our Hennessy Lodge which was a stunning chalet in the heart of The Winter Garden. There are a couple lodges scattered around the site, each with its own unique rustic charm. We visited during the week and we were pleasantly surprised by the extremely high level of service we received which is of course customary of The Four Seasons experience around the globe. Rosalind Ackerly, Four Seasons Floral designer, gave The Winter Garden the extra touch, with the garden featuring blue pine trees and glistening white birch twigs. This is clearly noticeable in the subtle touches around the experience such as small festive baubles adorning our lodge and warm sheepskin rugs. Our table was laid with menus, rolled parchment sealed with a ribbon. We eagerly unfurled the parchments to see what winter delights The Four Seasons had for us. The Four Seasons hosts the seasonal Winter Garden for a limited duration so we were fortunate to experience it in all its festive glory. Pleasantly situated in central Mayfair the prestigious venue in encapsulated with a small picketed fence adding to its fairy tale charm. From the comfort of our Hennessey lodge we were offered some warm blankets with which to wrap ourselves in, while we were bathed in the light of glowing lanterns. As we waited sipping our warming Park Lane mulled wines we admired the beautifully presented décor. 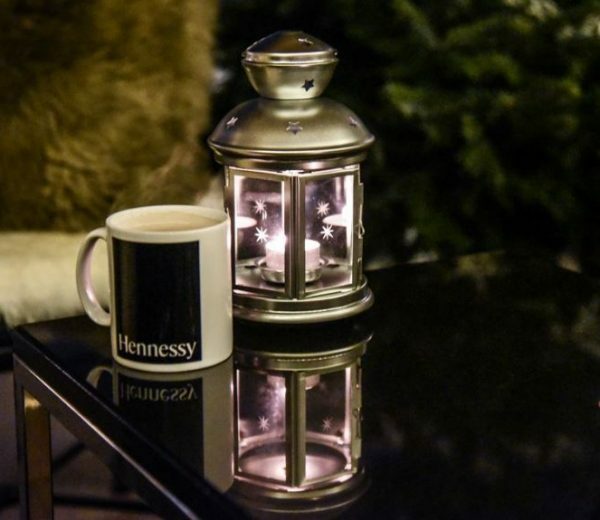 Another great aspect of our experience was the delicious Hennessy inspired drinks in celebration of The Hennessy Gold Cup held on Saturday 26th November. We enjoyed the thick Hennessey Infused Hot Chocolates. Four Seasons have also crafted a pomegranate cocktail delight The Hennessy Mandarin with a sharp and crisp citrus flavour. The culinary team had clearly put a lot of thought into the menu which Executive Chef Romuald Feger is responsible for creating. We enjoyed classic croque monsieur’s with buttery soft tops that melted with each bite, deliciously presented on white platters sprinkled with generous shaved black truffles and melt-in-your-mouth cheese. The waiter brought us over some round Lidgate Butcher sausages in soft white buns, bursting with caramelised onion marmalade, crispy bacon and a tantalizingly spicy mustard dip. We thoroughly enjoyed warm onion soup which was served in a black round pot perfect for sharing. 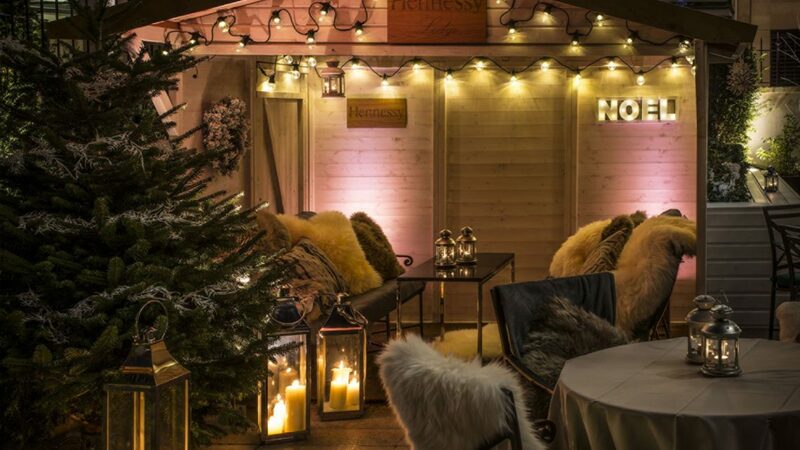 The charming feeling of being in The Winter Garden alongside the delightful setting made it an unforgettable experience in the lead up to Christmas. Lavish yet simplistic, time flew by while experiencing the delights of The Winter Garden. A natural wood crafted experience transports you to a wistful time of small village life. 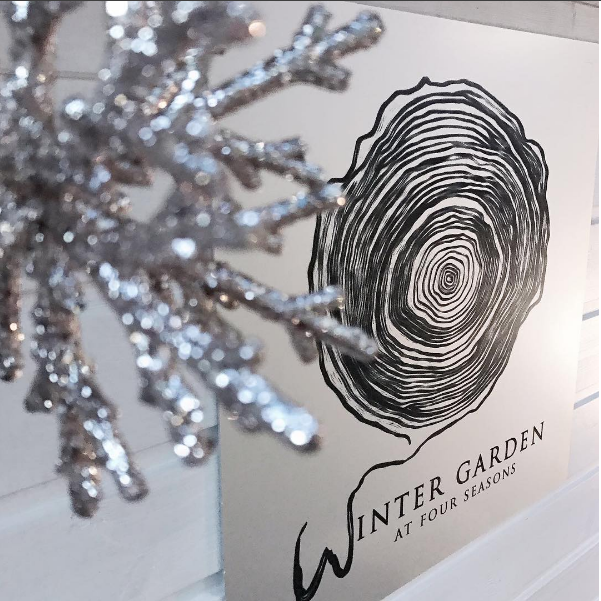 The Winter Garden is the perfect Christmas retreat far away from the hustle and bustle of the busy streets. Overall I would most certainly re visit The Four Seasons Winter Garden, elegantly presented, impeccable service and a central location in Mayfair. This Wintry Park Lane retreat is somewhere I would bring my friends and family, year after year. The wintry extravaganza is decadently festive and I would personally recommend the delightful cuisine. The Winter Garden is available from 11:00am-12:00pm every day until the end of February 2017.